Since 1998, the Boryeong Mud Festival has been attracting tourists from all over the world. Mud for the skin, mud for the thrill. 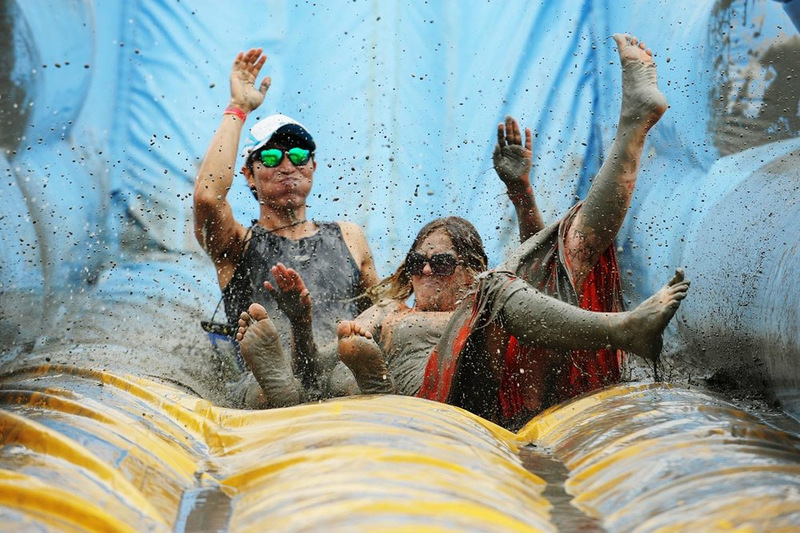 Experience more than a week-long of fun at the 2018 Boryeong Mud Festival! The event runs from July 13-22, 2018 at Boryeong, which is only 2 hours away from Seoul. Recommended for friends, families, and backpackers! For convenience, booking links are provided below. Boryeong Mud Festival is an annual event that gathers locals and tourists from all over the world. It usually takes place in July or at the height of Korea's summer season in Boryeong, which is a nice coastal city in the South Chungcheong Province. The event is said to be one of the largest and most-anticipated event in South Korea, which attracts over 3 million visitors who cover their whole body with Boryeong mud. Event mini-activities include wrestling, swimming, and sliding in mud. There's even a mud massage zone where participants can soak up all the benefits of Boryeong mud flats. With such popularity, Boryeong Mud Festival has been featured by various media organizations, such as NYTimes, CNN, CCTV, and Reuters, to name a few. Of course, mud zones where families, adults, and children can cover themselves in mud will be available daily. Events will be held in and around Daechon Beach (or the Mud Square), which is located at 897-15, Daehae-ro, Boryeong-si, Chungcheongnam-do. There are a couple of buses that can take you to Boryeong bus terminal. Whether you're coming from Seoul, Incheon, or Daejeon, you will find multiple bus services that can take you to the festival. Bus tickets are usually sold for an average price of ₩12,500 for adults (around ₱595 or $11) and ₩7,000 for children (around ₱335 or $6.2). Click here to find the schedule and bus types available. You can take the Mugunghwa-ho or Saemaul-ho lines to get to Boryeong. You can easily reserve and purchase your tickets via Korail's website or any of the ticketing booths in Incheon Airport or Seoul Station. However, if Boryeong would just be one of your many stops, we'd recommend buying the Korail Pass. It's a lot cheaper. Read more about the Korail Pass here or purchase it below. Here are the hotel recommendations by the Boryeong Mud Festival 2018 organizing committee: Hotel Kakao Story, Hilling Pension, etc. Click here to view the property listings in the area from Airbnb. Get to Boryeong in the most efficient and budget-friendly way possible. Take unlimited rides on most Korail trains for 1, 3, 5, or 7 days. Discover South Korea by traveling on over 80 routes and 600 stations with the Korea Rail Pass. Take advantage of additional discounts on accommodation and tourist attractions when you use your KR PASS. Save even more on child, youth, or group Korail Passes. If you don't have a Klook account yet, create an account using my referral code below to earn instant credits! It is said that some researchers found Boryeong mud to have more healing properties than Israel's Dead Sea. The event is similar to Brazil's Rio Carnival and Spain's La Tomatina. It's that huge. Couples will enjoy the scenic and romantic Daecheon beach. 30% of tickets are available online per day and 70% of tickets are available at the door. If not purchased online, please purchase at the door. Please be aware that Boryeong Mud Festval tickets may sell out early and at weekends. There may be a wait to enter the Zone and to purchase tickets on busy days. Adults with 'Kids' Zone' tickets are allowed to enter the 'Regular Zone.' However, adults will not be allowed to enter the 'Kids' Zone'. Tickets will NOT be reissued or refunded if lost, stolen, or damaged tickets. No reproduction or alteration of the purchased ticket will be sold to third parties. We (Incorporated Foundation Committee of Boryeong Mud Festival or sponsored companies) take NO responsibility or liability if the tickets are purchased through a third party. Online and on-site ticketing closes at 17:00. If you made an online reservation for your Boryeong Mud Festival tickets via Klook or Trazy, please take note of your reservation number so you can get a wrist-band at the pre-order booth. For more features and Korea travel guides, like ManilaxSeoul on Facebook.